NEVERLAND TRANSIT AUTHORITY: Hey, Mr. Wilson! No, it's not his love of chimichangas. 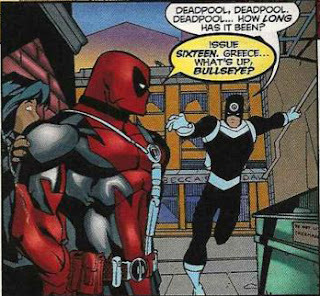 You see, through some extent of events, along with getting his "super powers", Deadpool has become self aware. That is, to say, he knows he's a fictional character. And not just in one book, but in all his books, in every appearance, every fanfic, fan video, in the adverts for his upcoming movie, and - we assume - in the upcoming movie, itself. It's been proposed before by old religions and even some more modern philosophy about the idea that the whole of existence could be nothing more than someone's dream, and that we could all be running around, going about our business, the background engine that fuels that dream. It's such a thing that a whole branch of science has broken off to uncover any truth to their personal thesis; we are all living in nothing more than a giant hologram. If you've every stumbled upon a glitch or a "blue hell" in a video game, you can imagine how frightening that idea may be. And remember, when developing a computer animated cartoon, you are essentially building a small world unto itself with its own rules and dimensions. Personally, I don't really want to delve too much into this whole idea. The mechanics behind such an awareness would be mind altering, if not downright shattering. (Which might actually explain Wade Wilson's particular various instabilities.) But I do wonder what someone like the late Alan Watts would make of a cartoonist's own creation perplexed about the nature of his creator. No doubt, if you follow my on any of my social media - Facebook, Instargam, or Twitter, you know that recently, due to the economy and real estate markets here in the San Francisco bay area, we at Neverland Transit Authority have lost our Grand Central Station, and are currently working out of a temporary location in a rural, country setting. 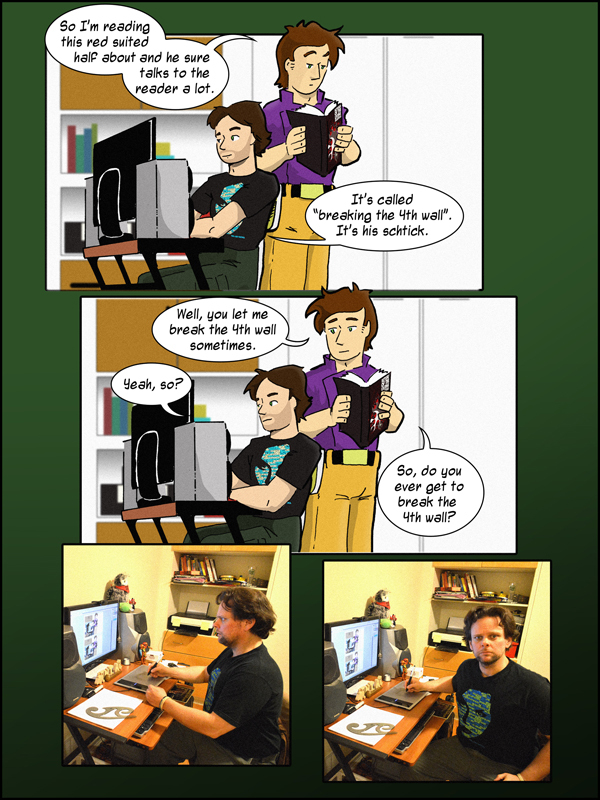 We're working hard to get things back up and running, and hope to return to Galactic Gun: The Adventures of Justin Bailey within the next month. In the meantime, don't forget to check out our newest feature Station House Radio; bringing you all the music that keeps us rolling down the track.